Touch Eco Duo and you will fall in love with it. By mixing baby alpaca and Merino wool, Cascade has created an incredibly soft, pliable yarn. The two fibers that are used are in their natural colors, so the line is composed of combinations on gray, brown, and natural. 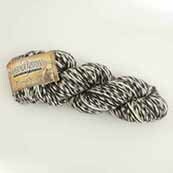 The natural variations in these colors give a subtle variegated effect to the yarn. Eco Duo comes in a reeled hank, which must be wound into a ball before use. We are happy to wind the yarn for you at no charge, but this does make the yarn non-returnable. If you would like your skeins wound, please request it in the "Shipping Instructions" box during the checkout process.